The work Portable Camera Obscura is a walk-in, room-sized camera, a tent that breaks into multiple pieces. A camera obscura is a lightproof room with a small hole or simple lens on one side that projects the world outside, inside onto the walls of the room. The darkened tent becomes a temporary site. A moving image on the tent wall stirs in the breeze and a proto-filmic experience emerges. It is like being in a giant camera but no exposure is made. Letting go of the habit of picture-taking, it instead invites embodied immersion in the inner life of the camera, in the ongoing movement of experience out of which still shots are extrapolated as events. It draws attention to immanence, creating a liminal space to witness overlooked and invisible experiences and inviting exchange between people mutually immersed within. This is a different kind of space than usually accompanies photography. The viewer must slow down as eyes take time to adjust to the transition between bright sky and dark tent: Only then does the image become visible. The Portable Camera Obscura offers space to apprehend the world differently, to think about what transitions or passages can’t be picked up by the ubiquitous use of cameras in everyday life and in elite practices. What forms of life (and more) become missing as a result? What continuously arises and how is this shared between immersed beings? The camera obscura challenges the dualistic split of the world into either subjective or objective, art or science, self or other, and instead asks how is photography able to invoke multiple phenomena at once? What does consciousness of this complexity feel like? This work explores the phenomena of pinholes that the camera obscura and photography are based upon: Tiny holes of light reflect an image that can be produced simply by the crossing of leaves. As something that humans (and more) have always experienced, how is photography embedded in human culture and the history of the universe? The practice of taking people out into contemplative environments is an experiment into transforming places into more than we might expect. In the collective experience in the tent people report feelings of surprise, and set out to describe the feeling of an ongoing unfixed moment. It provides illumination into rich layers of visual micro-politics and spirituality that get felt in the body: Those that have joined me in the tent report the visual aesthetic of a dream, the act of entering and leaving the tent mimicking birth and the strangeness of a moving photograph. One person reported that “The images projected on the walls of the camera had so much of the visual aesthetic of my dreams it was uncanny. I literally felt as if that quality was being mimicked — outside of my sleep, outside of my self.” Others report that in the moment of the camera, “I was a child again, experiencing something, even just briefly, that no physicist’s explanation could extinguish. I could not shake the sense that even for those few moments, the image both revealed the contingent nature of my outside-the-tent experiences of… the world and actual radiance and – in the literal sense – uniqueness”. 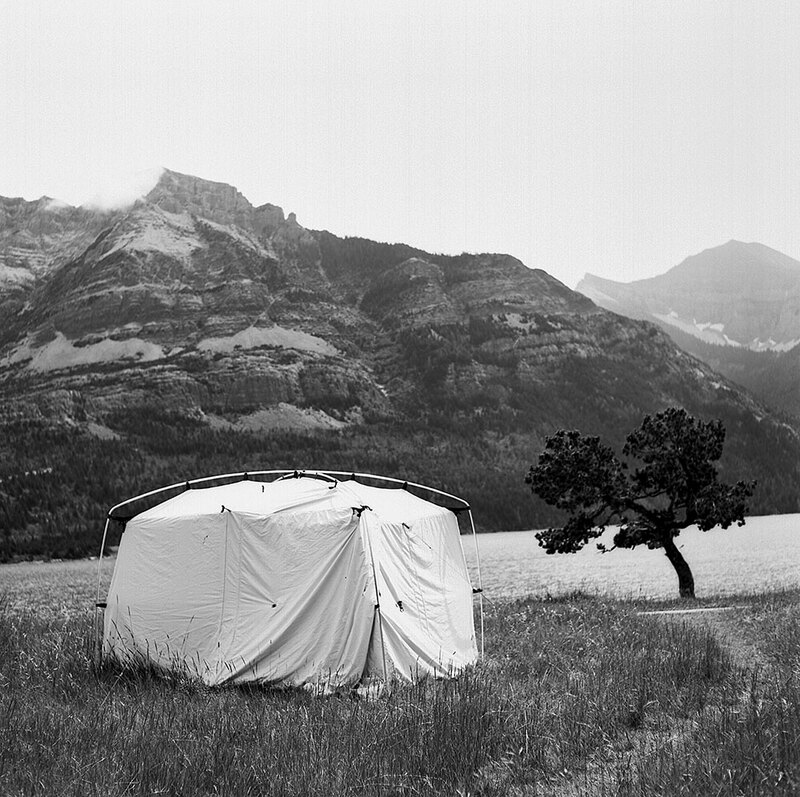 The camera started out as part of my PhD work in Visual Art and Anthropology (UVic 2010) and from 2009 – 2010 I worked in Waterton setting it up in popular photographic vistas as well as guiding people into epic places where historical photographs were taken. 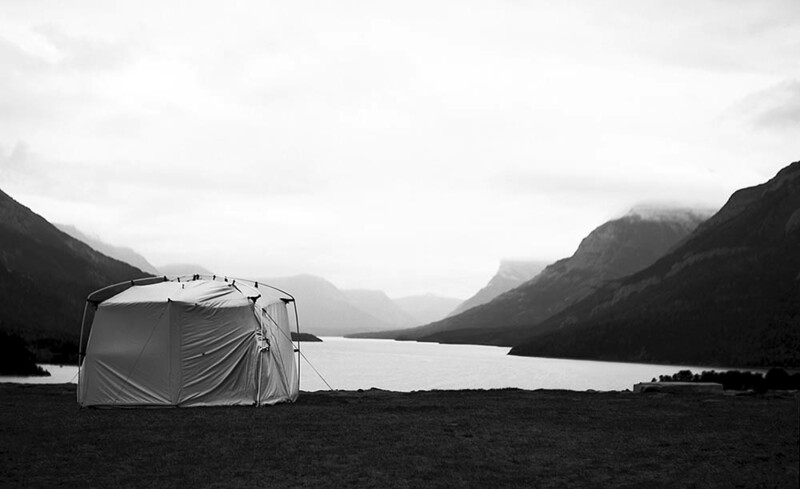 It was an attention to re-enacting historical photographs but rather than take an exposure, we worked together to carry and set up the tent and then loiter, immersed in the embodied experience of place, history and ideas about wilderness. We opened up a space for sensed practice, for interplay between photography and the agency of the more than human world as it is represented, felt and made socially real. The camera picked up momentum and we’ve traveled to monumental and mundane locations in Canada and the USA: from Robert Smithson’s infamous land art work Spiral Jetty, to university campuses, art galleries, National Parks, and scientific research stations. Joined inside the tent by children, elders, students, locals, artists, academics, university administrators, scientists, and writers, I’ve been able to promote and witness conversation and learn how photography makes us human. 6 person, 2 day backpacking trip led by artist into a backcountry meadow (officially closed to human traffic) to look for remains of an outfitter’s camp, relocate an historical panoramic photograph by Bert Riggall in the early 20th century. 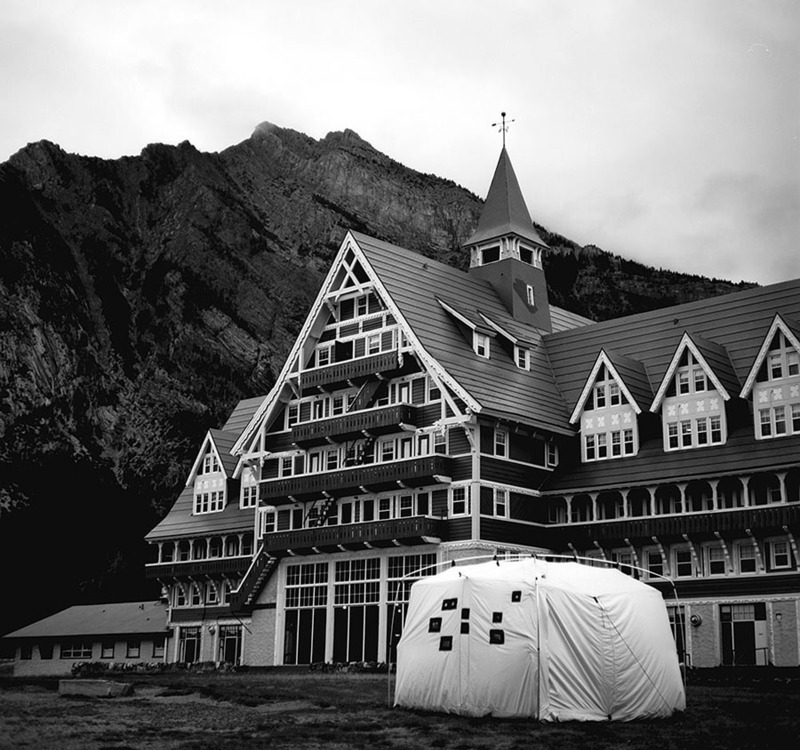 “Prince of Wales Hotel Hill”, Waterton Lakes National Park (present-day). Installed in Crane Arts Gallery as a part of the exhibition, Ethnographic Terminalia. Tent, two spotlights, early 20th century hand-tinted photograph by Kabel for Great Northern Rail, easel, pillows (inside).